Put Your Money Where Your Weight Is! There's no aerobic value in throwing dice, spinning the roulette wheel or playing slots--but a fitness company thinks dieters can gamble themselves into better shape by betting how far they can tip the scale. In a new fitness initiative, dieters who wager $100 will win $200 if they lose 10 percent of their bodyweight in six months. Those who can't lose the weight eat the loss. David Roddenberry, co-founder of HealthyWage, which launched the 10% Challenge, says the program has more to do with rewarding healthy behavior than it does with gaming. "Academic studies and literature suggest it's an enhancement -- it's not like the money alone will make you lose the weight," Roddenberry told The Huffington Post. "It's for people who are looking for that additional motivation." Becoming healthier might seem like motivation enough, but without smaller incentives and objectives, it can be hard to stay on track, said Roddenberry. "It's lots of little choices that make us overweight," Roddenberry said. "Conceptually you understand that having high blood pressure or blood sugar is a bad thing -- but it's very hard to make good individual decisions to get there." Rewarding people when they make the right choices can help them change their habits and live healthier lives, according to a recent study by University of Connecticut researchers, who determined that "reinforcement-based intervention substantially enhances short-term weight loss." "We think everyone should have an incentive plan when they start a diet," Roddenberry said. 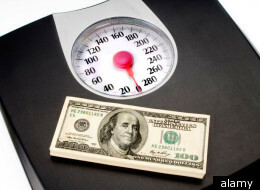 "The research shows you are more effective at losing weight with an incentive plan." A former hedge fund employee with a background in health policy, Roddenberry launched HealthyWage in 2009 at a TechCrunch event. Since then, HealthyWage has attracted more than 100,000 participants with incentive-based dieting programs. In a recent contest offered by the company, roughly 25 percent of participants reduced their body mass index from levels classified as obese to levels classified as normal, winning money in the process. In the 10% Challenge, which is open to anyone in the United States, Roddenberry is hoping 40 percent of participants will shed pounds and make money. "We try to make it so we have a lot of successful participants," he said. "We try to have as many winners as we possibly can and still cover our costs." Though the company keeps the cash wagered by unsuccessful dieters, Roddenberry says the majority of HealthyWage's total revenue comes from corporations, insurers and sponsors. "We're not making that much on people who are putting their skin in the game," he said. "We're making it on the companies that want to help them be healthy and the sponsors that want to connect with them." HealthyWage isn't alone in linking weight loss with monetary gain. There's TV's "The Biggest Loser," which awards its winner with a prize of $250,000, and FatBet.net, which lets dieters wager among friends on their weight loss, among other endeavors that mix fitness and finances. But HealthyWage touts itself as the only company in the country that pays people if they lose weight. Even though participants in the 10% Challenge have to put up a wager to take part, Roddenberry insists that betting on weight loss isn't a form of gambling. "A gamble is a game of chance and this is a game of skill," he said. "If you lose the weight you will get paid -- there is no chance involved. From a legal perspective, we are comfortable that is a contract between a participant and us." Anti-gambling groups were reluctant to comment on whether this form of wagering qualifies as gambling. "The definition of gambling is generally considered to be anytime you risk something of value for something of value and the outcome is not guaranteed," said Robert Johnson, executive director of the California Council on Problem Gambling. As every dieter knows, the outcome of a fitness plan is anything but guaranteed. But Roddenberry says HealthyWage isn't gambling, even though it uses terms like "bet," "win" and "lucrative" to promote its programs. "We are desperately in need of solutions that make weight loss exciting and fun," he said. "If using language around gambling makes it more exciting for people to start a weight loss program, we're all for that." Participants in the 10% Challenge must certify their weight at the beginning and the end of the contest at a doctor's office of one of several thousand health clubs affiliated with the program nationwide (participants are not required to be members of the gyms, Roddenberry said). Every week, contestants submit updates on their weight online. Once they've registered, participants can use any weight loss technique they like, from The Atkins Diet and P90X to Convict Conditioning and The Caveman Diet. So long as they reduce their weight by 10 percent in six months, they double their $100 wager. But that won't be enough to motivate those who suffer from the most severe weight problems, according to personal weight loss coach Brenda Gold. Gold told The Huffington Post she could imagine the program inspiring people who want to shed a few pounds, but until the final payout nears $1 million she doubts a contest like the 10% Challenge will motivate dieters who need the most help. "I've been at this almost 30 years, and people that are desperate are desperate," the Orange County, Calif., weight loss coach said. "Feeling miserable, feeling like an outcast, being discriminated against, not being able to move and walk up steps -- if that's not motivation enough, then money is like tenth in line." So far, more than 1,000 people have signed up for the 10% Challenge. Tammy Brennecke, of Ankeny, Iowa, signed up hoping that the added incentive of making money -- or the disincentive of losing her $100 investment -- will provide the impetus to stay committed compared to other fitness programs. "I wouldn't say it's gambling," Brennecke said, "but it's putting a carrot out there for myself." And may I add....how many tears you will have to cry too! If you have a dream - to be healthier, to have better relationships, to get that right job....whatever it is - wake up everyday and work toward that dream. Now THIS is funny. How clever....a diet patch!